Photographer Richard Copley in Memphis on March 18, 1968. In his first paid job as a photographer, Copley was sent to the Mason Temple, where the Rev. Martin Luther King, Jr. rallied a large crowd of sanitation workers. It was the same location where King would later deliver his famous "Mountaintop" speech. Photographer Richard Copley with the Rev. Cleophus Smith, who was a young man when he participated in the sanitation workers' strike in 1968. Richard Copley was just 22 when he got his first paid job as a photographer. But that assignment propelled him into one of the most significant historical events of the 20th century -- and his career. 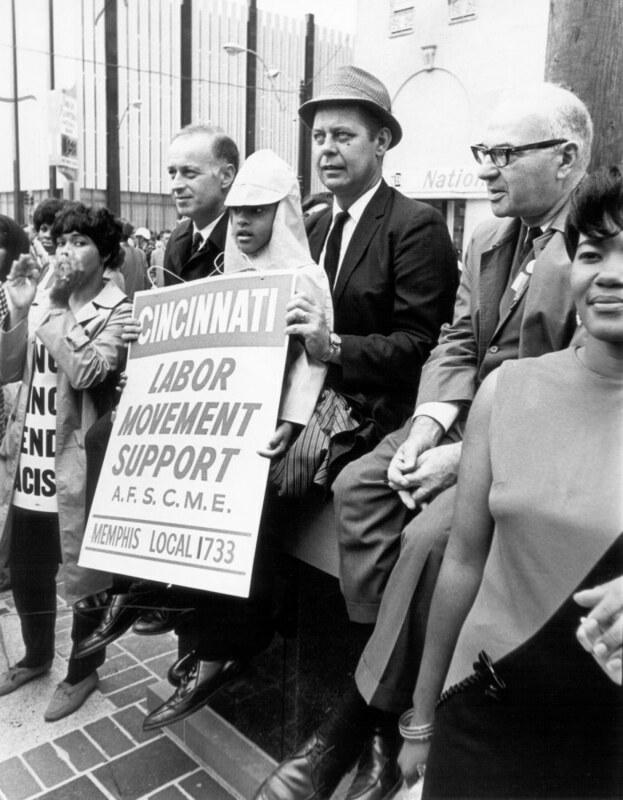 As the photographer for the American Federation of State, County, and Municipal Employees (AFSCME) union, Copley was initially asked to attend the Rev. 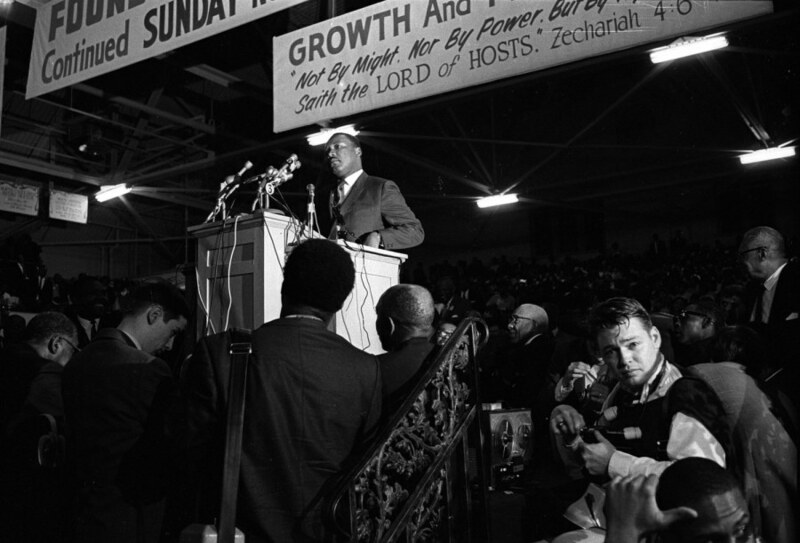 Martin Luther King Jr.’s March 18, 1968, speech in Memphis, Tenn., (pictured above) where the civil rights leader spoke to thousands of sanitation workers who were fighting for better pay and improved safety standards after two Memphis garbage collectors were crushed to death by their truck’s trash compactor. 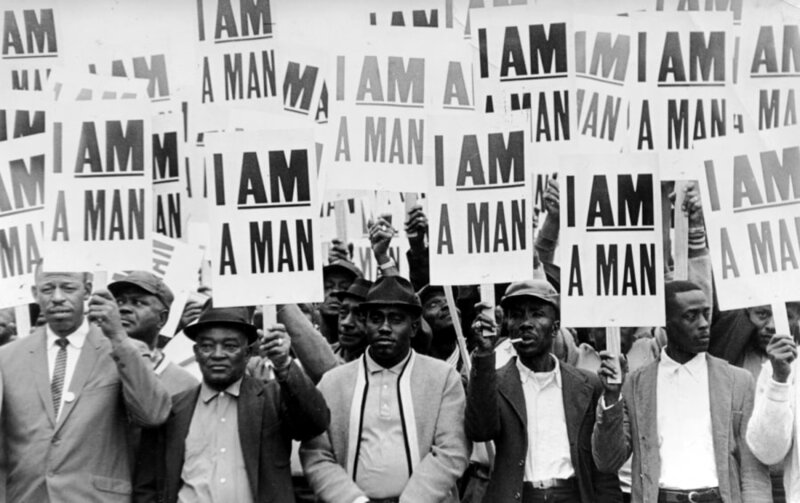 The most famous of Richard Copley's sanitation strike photos featured the iconic "I Am a Man" posters carried by striking members of Memphis Local 1733 during the march led by Dr. Martin Luther King Jr. on March 28, 1968. King promised to come back and lead a protest across the city, and on March 28, he did. At the march Copley captured what is now his most famous image: the sea of signs reading, “I Am a Man.” It didn’t take long, however, for things to turn violent. “You could hear the glass breaking.… I knew all hell was breaking loose. I will have to say it was exhilarating and terrifying all at once,” said Copley, who got pepper-sprayed during the event. 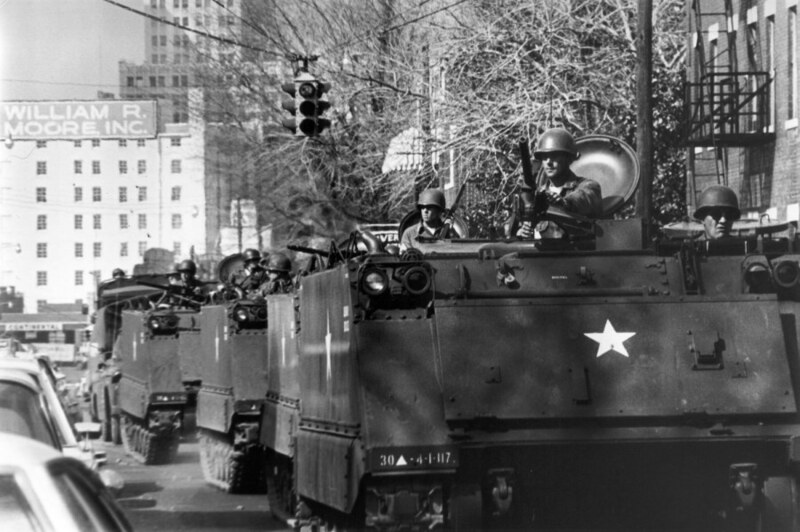 The National Guard arrived in Memphis on March 29, 1968, after the sanitation workers' strike turned violent. King was quickly pulled out of the protest as the violence escalated, and the next day the National Guard showed up. “It was frightening – it looked like a war zone. It was just a show of force, obviously, and ... in my mind it was overreaching. But on the other hand you have to consider the time – it was 1968, and there had been riots in other cities, so I’m sure the 'powers that be' thought it was necessary,” Copley said. 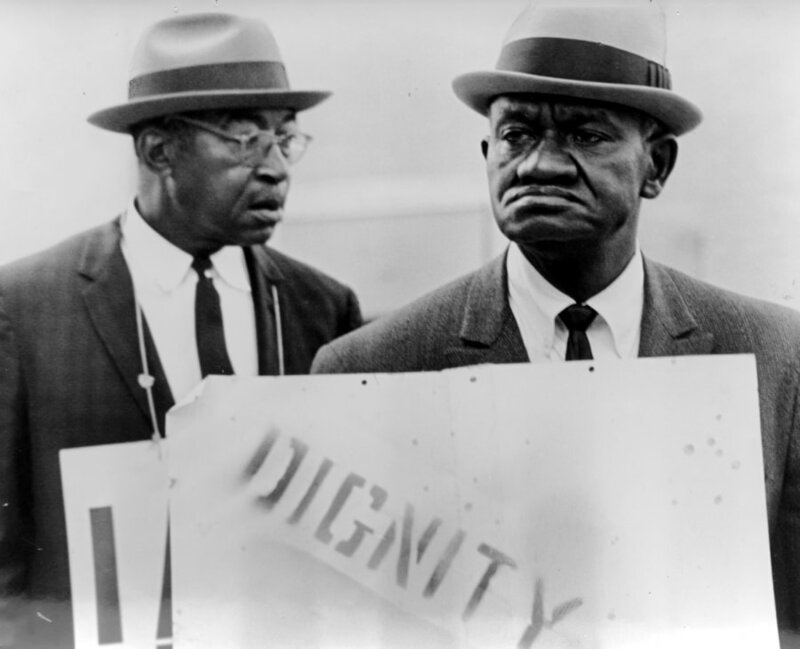 During the peaceful march held on March 29, Copley shot the image that would become his favorite, the one he called “Dignity”: a photo of two men holding poster boards in their best Sunday attire. That combo of their formal dress and “the stern looks on their faces” has always stood out in Copley’s mind, he said. Sanitation workers the Rev. Theodore Hibbler, left, and Ted Brown march in downtown Memphis on March 29, 1968, the day after the famous sanitation strike march led by Dr. Martin Luther King Jr. was shattered by violence. King returned to Memphis on April 3 and was assassinated the following day from the balcony of the Lorraine Motel. 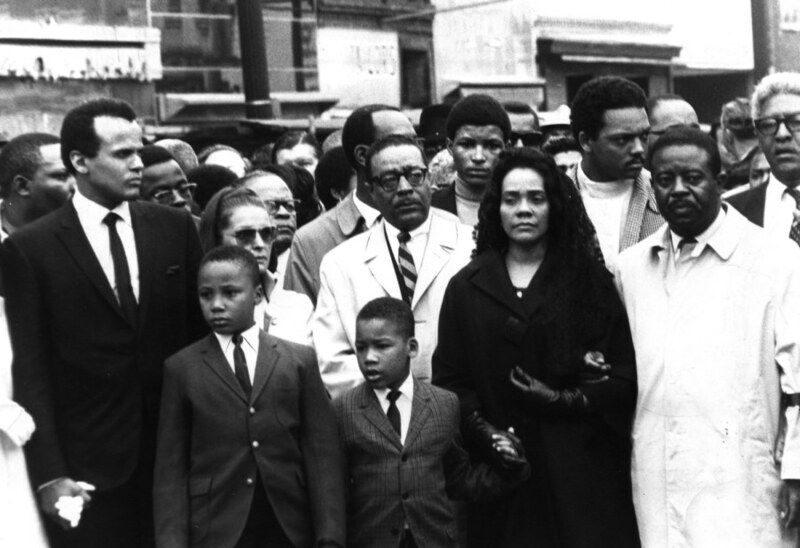 The King family at the April 8, 1968, memorial march for the Rev. Martin Luther King Jr., which was attended by an estimated 42,000 people and led by his widow, Coretta Scott King. Now, 45 years later, the 67-year-old photographer still has a camera in his hand. Now, though, instead of a 35mm, he shoots video in 1080i HD. As a freelance photographer, his work has appeared on several network news broadcasts, including "Nightly News with Brian Williams." Although he has covered several major events such as 9/11 and Hurricane Katrina, Copley says his most memorable assignment was in Memphis in 1968. Richard Copley’s photography is currently being featured at the National Civil Rights Museum in Memphis, Tenn. The exhibit will be moved to Memphis City Hall later this month. During the April 8, 1968, memorial march to honor the Rev. Martin Luther King Jr., who had been shot four days earlier, Richard Copley captured this image of a white man holding an African-American child. Labor groups from all over the country showed up to pay tribute to the Memphis workers and King. It's been 45 years since Martin Luther King Jr. was killed after coming to Memphis, Tenn., to support the sanitation workers' strike. 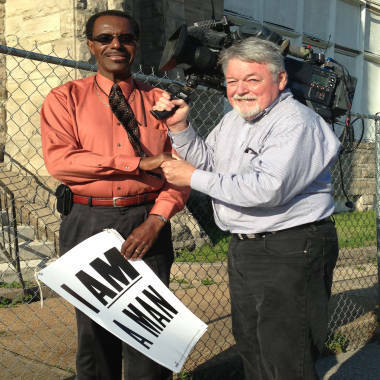 Two of the men who demonstrated in the streets that day spoke with NBC's Ann Curry about their fight to make a better community for their families.